Abnormal Tricuspid Valve resulting in atrialization of the right ventricle What Is It? This rare defect involves an abnormality in the Tricuspid Valve, which connects the right atrium with the right ventricle. In Ebstein's Anomaly of the Tricuspid Valve, the valve forms abnormally and is lower than usual in the heart (shown in the diagram). This displacement of the tricuspid valve results in insufficiency (leakiness) of the valve, which causes the right atrium to be larger than normal. In addition, the "leaflets" or flaps of the tricuspid valve are usually abnormal in form and often adherent to the right ventricular wall. This stretched enlargement of the right atrium can predispose children to abnormal heart rhythms. Also, the abnormal position of the tricuspid valve causes part of the right ventricle to become functionally part of the right atrium. This is known as atrialization of the right ventricle. Frequently associated with this defect is a hole in the muscle wall that separates the atria, or upper chambers of the heart, known as an Atrial Septal Defect (ASD). 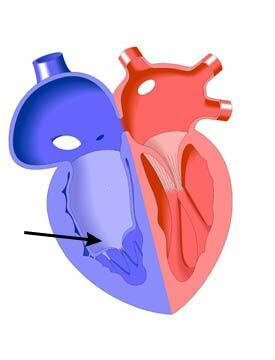 Because of the increased pressure in the right atrium as a result of the insufficient tricuspid valve, blue (oxygen-depleted) blood in the right atrium will often cross to the left atrium through the ASD. This results in de-oxygenated blood in the left side of the heart and decreased oxygen levels in the body.